What's inside the new D155 is impressive. Take the Briggs & Stratton V-Twin Extended Life Series (ELS) engine. It's a powerful long-life engine that has been clocked in at up to 50% longer engine life† than other Briggs & Stratton engines. Then there's the quality of cut. The kind you get with three sharp, grass-processing blades in a solid-stamped, 48-in. mower deck. 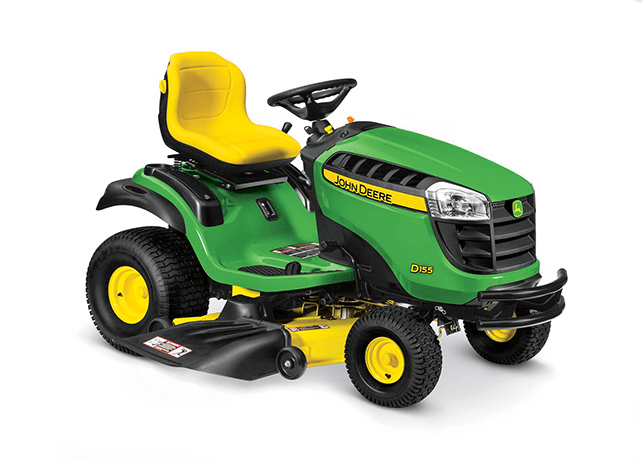 Just what you'd expect from a John Deere of this caliber. What's more, the 15.9-in., high-back seat with lumbar support is more like a comfortable chair than a tractor seat. And the large steering wheel makes maneuvering easy and the ride a pleasure. Other features include a fully welded steel frame, dent-resistant hood, and a cast-iron front axle. And that all adds up to legendary John Deere durability.